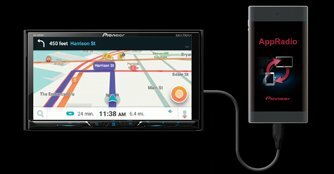 Pioneer's new Z-series receiver, the AVH-Z5050BT, boasts greater connectivity and entertainment value, and turns any car into a smartphone accessory. Almost everyone has a smartphone these days, and the convenience that a smartphone brings us is simply unbeatable. Far more than just communication, a smartphone also allows us to enjoy much more entertainment while on the move. Even in-car entertainment systems are now embracing the smartphone revolution these days, with the availability of Apple's CarPlay operating software allowing users to essentially convert their vehicles into a smartphone accessory. For those looking for an aftermarket solution that offers compatibility with CarPlay, Pioneer has now released the AVH-Z5050BT, which brings even greater connectivity to your smartphone entertainment options right at your fingertips. 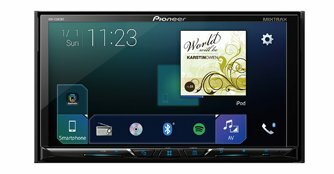 The Pioneer AVH-Z5050BT is the latest multimedia receiver that brings enhanced smartphone connectivity for today's mobile lifestyle. It offers integration with Apple CarPlay, and extends your smartphone's operating system platform into your car's multimedia system, giving you a safer and smarter way to utilise your smartphone's functionalities while on the move. It also comes with Bluetooth AVRCP 1.6 capability, enabling it to sync up with other Bluetooth devices. In addition, the AVH-Z5050BT also comes with Pioneer's AppRadio Mode+, which links up with the AppRadioLIVE app to give you access to all the elements of your digital lifestyle in one place. AppRadioLIVE works with AppRadio Mode + to allow you to play video from two sources, either straight from your smartphone, or through video streaming. Finally, the AVH-Z5050BT offers a fully refined, simple and easy-to-use interface that provides easy operation and a more engaging user experience. Its 7.0-inch clear type resistive touch panel with LED backlight displays brighter, more vibrant colours and offers increased touch sensitivity that is more responsive than traditional resistive touch panels. The AVH-Z5050BT comes incorporated with Apple CarPlay, which offers a safer, smarter and more fun way to use your iPhone in your car. Apple CarPlay is extremely easy to use, and launches automatically once you plug your iPhone into the system. 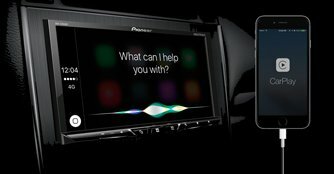 Besides being able to make calls, having your text messages read out to you or listening to music, Apple CarPlay also offers Siri voice recognition integration, so that you can operate the various functions using voice commands. Apple CarPlay also allows usage of Apple Maps, and there is no need to install a separate navigation system in your car. AppRadio Mode+ offers Waze and Google Maps compatibility, allowing you to use the navigation app of your choice. AppRadio Mode+ is Pioneer's proprietary free application to view and control third-party utilities, navigational aids and social networks installed on smartphones. AppRadio Mode+ is compatible with AppRadioLIVE, which aggregates maps, music, news and events into four interactive quadrants on screen. It helps to simplify your drive by combining the information you need during your commute into a single, simple-to-use interface, offering quick and easy access to personalised information needed in the in-vehicle environment. AppRadio Mode+ also offers navigation options with Waze and Google Maps compatibility, allowing you to utilise the smartphone navigation app of your choice. The AVH-Z5050BT has a new full-HD (1080p) display, and offers support for popular video file formats and new and improved 24-bit true colour LCD screen, these receivers can reproduce up to 16,777,216 hues, or around 256 times better colour fidelity than most regular displays, providing richer and true-to-life visuals. It also provides unlimited entertainment options with Spotify support for your music streaming needs, and its ultra-clear HD display makes it ideal for streaming videos in your car. 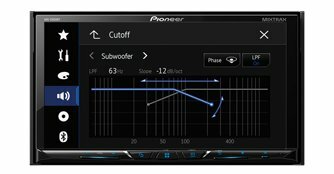 For more information on the Pioneer AVH-Z5050BT Multimedia Receiver, please visit the Pioneer Z-Series microsite, or the Pioneer AVH-Z5050BT product page.